As parents, we all want the best for our children. We hope and pray every step of their paths will be filled with joy and free from obstacles. Unfortunately, reality doesn’t always play out that way. By the time they’re teenagers, many children navigate some very grown-up challenges, including unplanned pregnancy. Your teen daughter’s possible pregnancy is a very big deal, so it’s normal if suspicions have you pretty worked up. More than ever though, this is a time to maintain a level head. Take some time to compose yourself, so that you can proceed with consideration and intention, rather than visceral reaction. If your daughter is indeed pregnant, she will need your calm and strength to help guide her. Before leaping to conclusions, look for supporting indications that your daughter may be pregnant. Is she displaying physical symptoms like nausea, appetite changes, unusual food cravings, fatigue or frequent urination? Is she behaving differently –suddenly wearing baggier clothes, having secretive conversations, spending more time in her room? Are her emotions more erratic? Is she unusually irritable or more likely to cry over seemingly insignificant issues? Any of these can be explained away on their own but in combination they may point to a pregnancy. If you now have a substantial case to believe your daughter is pregnant, familiarize yourself with the pros and cons of pregnancy options. A little research will allow you to offer helpful insights and feedback when you talk with your daughter. Look into what it really means to be mom-ready, how modern adoptions work and the tough questions she’ll have to face if considering an abortion. 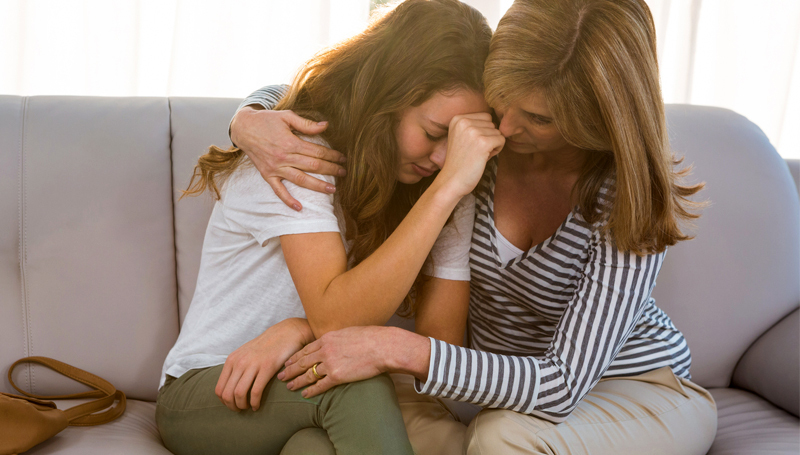 And, if you and/or your daughter has a relationship with her other parent, now is a good time to share your suspicions with him or her along with your suggestions for next steps. Starting the conversation is never easy. Pick a time and place that allows your daughter to feel emotionally secure and to speak from the heart. Let her know you have reasons to suspect she is pregnant, what those reasons are and that you are asking out of concern and love for her. If she confirms the pregnancy to you, your first job is to listen to and comfort her. Gently holding her hand or rubbing her shoulder are great unspoken signs of support. Eventually, she will almost certainly ask for your opinion. That’s when you should share your educated perspectives from the research you did earlier. Above all, remember that if your daughter is pregnant and all parties approach the situation with love, that new baby can be a blessing that will change life for the better. Unplanned teenage pregnancy is more common than anyone would prefer. In 2016, girls ages 15-19 in the U.S. gave birth to more than 200,000 babies. While that number may seem disheartening on some level, it also means you and your daughter are not alone. There are numerous government agencies and community organizations available to offer resources and support. In Gainesville, Sira is one such group. In addition to offering free medical pregnancy tests and pregnancy options counseling, we have a broad network of community partners to provide your daughter and her baby assistance they may need. If you believe your daughter may be pregnant, Sira’s caring staff can guide you and her to help for today and hope for tomorrow. Contact us today at 352-377-4947. At Sira, you’re never alone.